The Barnstormers were defeated on the road for only the second time this year in their loss to Cleveland 76-35. The Barnstormers kept the game competitive during the first half of play. With a running touchdown from Rodney Filer and two touchdown catches by Tommy Ellingworth. The Barnstormers went into halftime trailing the Gladiators 35-28. In the second half the Barnstormers were silenced scoring only twice, once late in the third quarter and once early in the fourth quarter. Cleveland’s offense came out firing and could not be extinguished by the Barnstormer defense. Charles Johnson recorded a blocked kick on an extra point attempt early in the fourth quarter. Cleveland just continued to extend their lead, ending the game with a score of 76-35. 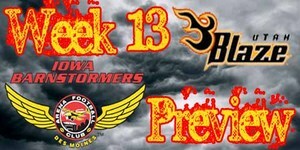 The Barnstormers return home this week to face the Utah Blaze for the first time in both franchises’ history. The Blaze have struggled all year and are currently on a six game losing streak. Their only victory coming in Week Four against the Bossier-Shreveport Battle Wings. The Blaze faced up against the Tampa Bay Storm last week and were defeated 40-65. Iowa Barnstormers vs. Utah Blaze will be broadcast LIVE on 1700 AM The Champ, on television on Mediacom Connections Channel 22, and on the Internet at www.theiowabarnstormers.com and at www.nifty-tv.com. -This is the first meeting between the Utah Blaze and the Iowa Barnstormers. -Leading Tackler: Antonio Malone (#20) - 10 GP, 67 tackles (46 solo, 21 assisted), 2 interceptions for 53 yds, 5 pass breakups. Larry Kendrick-DB/WR-#15 Week 12 Line: 5 Tackles and 7 Kick Returns for 118 yards. Larry Kendrick has been a strong addition to the Jack Linebacker position recording 42 tackles on the year. Early in the season Kendrick was splitting time with Tim Dodge returning kickoffs and now with Dodge’s retirement Kendrick has taken over full-time. Kendrick has averaged over 100 yard per game on returns since he has taken over. Kendrick has also show increases in each game in the amount of yardage he has returned. Don’t forget to get your tickets for the next home game THIS Saturday June 26th when the Barnstormers take on the Blaze! Call the Barnstormers Front Office to get your tickets TODAY: 515-633-2255!